One character in the film puts up how even in an action sequence in Baazi no one can dare mess up with Dev Anand and his hairstyle. The lead in this film (Ranveer Singh) too, in most of his scenes in the first half, has his hair perfectly kempt, like those artistic detailing depicting zamindar's palace in old Calcutta. We are in the same era when Baazi released, in early '50s. We know we are watching an old world, presented to us with the help of new age technology, with characters as contemporary as those from our times, relating to us with their pop-culture. Within early minutes of this setup, you'll know this can come only from the brightest kid at "Anurag Kashyap School of Filmmaking" who scored an A+ in his last, Udaan (2010). 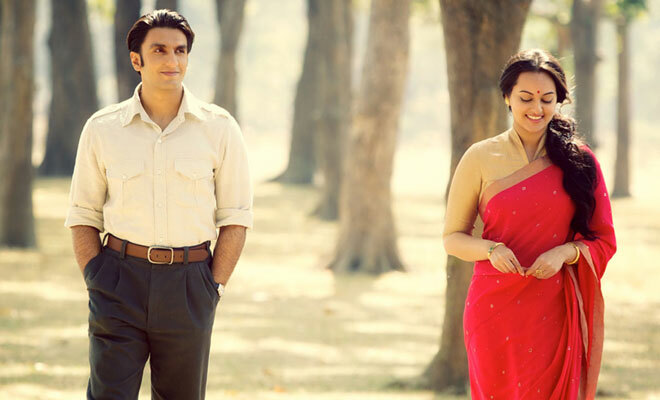 Pakhi (Sonakshi Sinha)- the female lead- is bound to fall in love with the lootera Varun (Singh) when he moves into her palace winning her zamindar father with his charm. Their togetherness is dealt delicately where spoken words aren't wasted and alone silence is allowed to fill up the intense air between them. In one such beautiful scene where they talk in hushed tone- one softer than the other- near the lake, you realise this is not a usual love affair we see on screen. The director wants us to indulge with them, feel them individually, and love them together. That's why, amidst the entire tensed and terrific backdrop, only their romance finds space in the second half of the film. The second half- based on O Henry's short The Last Leaf- takes a shift from many things. From a warm Calcutta to snowy Dalhousie, from yellow palette to blue giving the sense of shift from an engaging thriller to an indulgent romance where the terrific and monotonous soundtrack by Amit Trivedi sets the pace of the narrative. We are informed of the time where this part of the film is set in as soon as it begins, unlike the first half where we were given references to assume the period- like a Dev Anand song, end of zamindari system post independence. It's 1954. But what follows is enough to make it timeless. The writers had an option to take the plot to another level after the mid act. They chose to take their characters there. That's what the second half is about. It's about the struggle between love and life... while one has no love for life; other is all life for love. It's about the much needed closure of whatever happened between the lovers in the first half, or I must say it is the actual film while the first half was just an extended prologue to it. It's also about the inconsistent subtleties the director throws in...a dark past told in a single flash when Pakhi switches the bulb on and off just like she did when she was in love is a masterstroke, while the spoonfeeding flashback visuals to explain the well built metaphors could have been avoided. But it's the timelessness quality that makes it like one of those sadiyon purani kahaani (Yes, the lyrical Ankahee track closes the film) that Pakhi's father told her. It was about a king. This one's about a lootera. Read you review day before. went this evening, came back mesmerized and read your write-up yet again. Heart-wrenching and unusual melody!